Amongst the towering Dolomite Mountains in northern Italy, there is the perfect mountain scene. Towering thousands of feet about the Carezza Pass, the Dolomite peaks are perfectly framed by the lake and a beautiful forest of evergreens. In a region where the weather can change in a heartbeat, it was a race against time to capture this image. As I scrambled down to the lake, tripod in my hand and camera across my back, the fast moving clouds began to dissipate. A scorching sun and wicked winds combined to utterly break up the cloud cover in a matter of minutes as I snapped a massive panoramic. 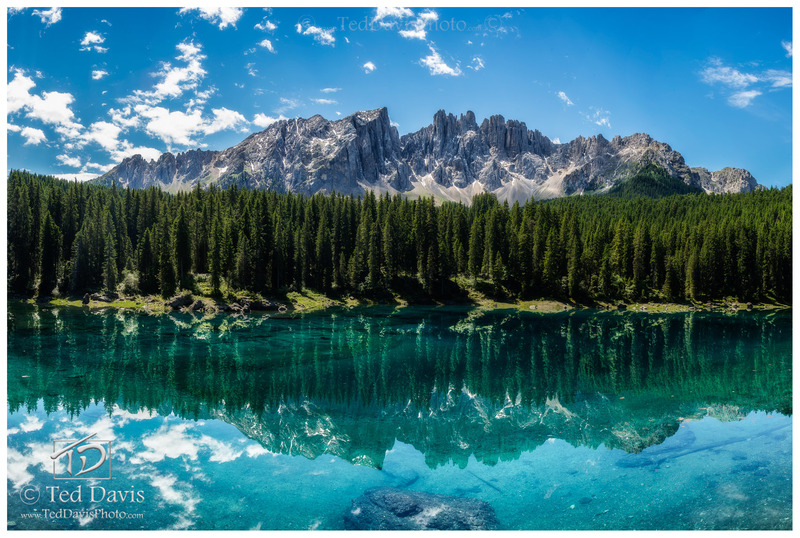 The fantastic glacial water led an air of turquoise mystery to the scene as it perfectly reflected the melting glaciers on the Dolomites and the fleeing delicate clouds. Photo © copyright by Ted Davis.